Upon entering the theater to see director Mike Leigh’s latest film, Mr. Turner, it occurred to me I hadn’t seen much of his work. I remembered being shaken by 1993’s Naked while in film school, and vaguely recalled some scenes from Secrets and Lies (1996), but I had missed everything else until now. I should probably correct that mistake. 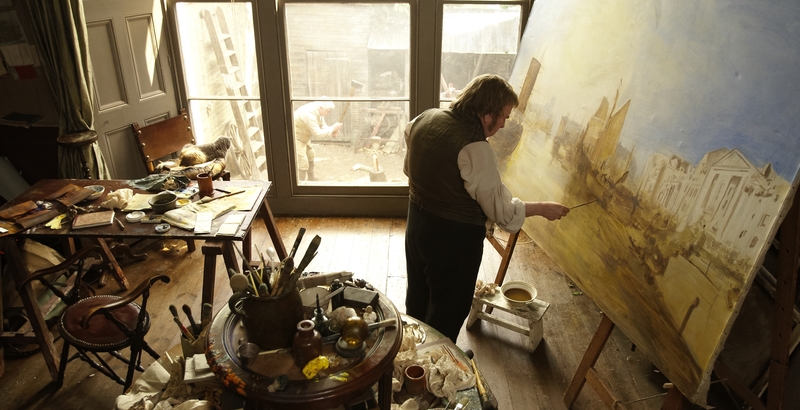 Mr. Turner is about the life of British Romanticist painter J.M.W. Turner, an eccentric artist whose depictions of nature were as savage as they were enthralling. The beauty of Leigh’s film is that he explores Turner’s personality from the same point of view, as a veritable force of nature: A brooding, intense, anarchic hulk of a man who could nevertheless be passionate, meticulous, and achingly human. And in longtime character actor Timothy Spall he’s found the perfect foil: The role fits him like a glove, expressing volumes with just a glance or a smile. As he insults the snobs at the Royal Academy of Arts, stares in awe at a sunset, or straps himself to the mast of a ship so he can experience the power of a storm, you can’t help but wonder what his next leading role will be. The man is a revelation. Just like a piece of art, Mr. Turner‘s naturalistic, improvisatory approach demands several views… and that’s a good thing.